There were no shortage of big domestic coupes to chose from in 1970's. However, it rare see them on the road these days. The Malaise era land yachts were big on the outside and small on the inside. Their asthmatic V8 engines got gas mileage in the teens and baroque styling stands out like a sore thumb now. It makes you wonder who in the world would drive a car like this in 2017. Today's seller left a little clue in the ad into their persona. 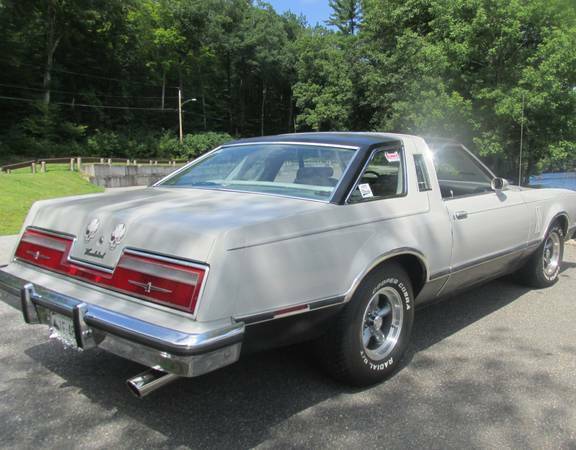 Find this 1977 Ford Thunderbird for sale in Torrington, CT for $4,500 via craigslist. 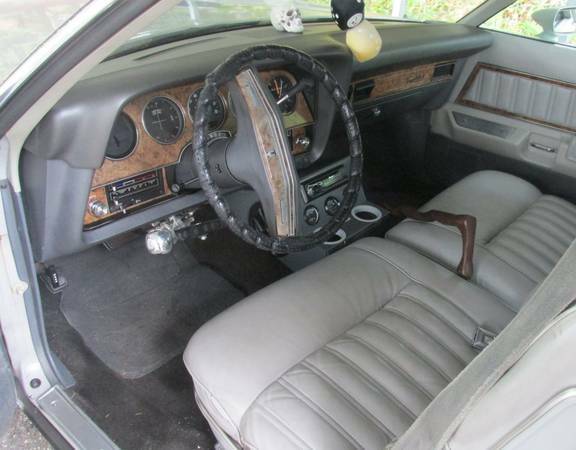 This interior picture shows off the leather seats, custom built center console, fuzzy dice, a dash mounted skull, acres of fake wood, and a PIMP CANE. Urban dictionary has some entertaining and colorful definitions/uses here: pimp cane. 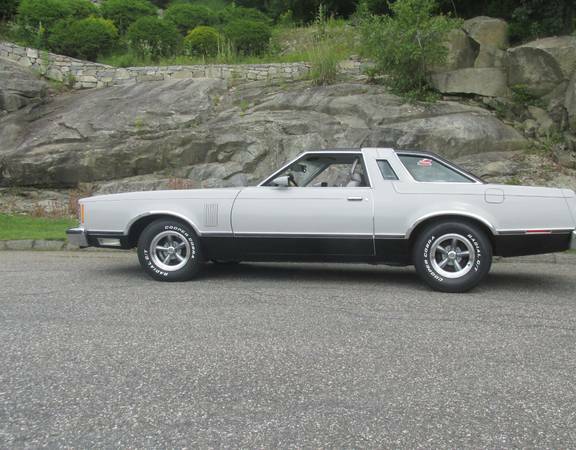 The seller notes the car is their daily driver and is clean inside and out. They claim to have spent $1200 on the vintage looking Legend aluminum wheels and meaty Cooper Cobra raised white letter tires. Other recent maintenance included: tune up, brakes, engine hoses, and new carburetor. The t-bird only has 90,000 original miles. 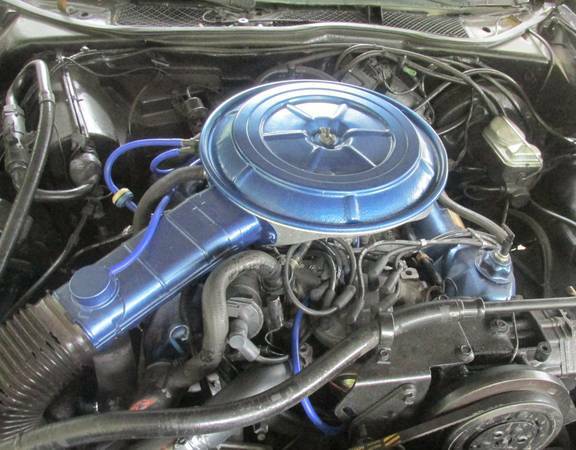 The 400ci Cleveland engine put out 175 horsepower in stock form. The seller notes some custom exhaust work done with a Thrush muffler, but there is only one (bigger than stock) tail pipe?? These seventh generation Thunderbird's have many interesting period styling cues like hideaway headlights, faux t-tops, tiny windows in the b-pillars, and faux shark gills on the front fenders. Cory is waiting on the spring weather to arrive so he can make some progress on his 1995 Mercedes C36 AMG project car. What the heck is going on at the gas pedal? or is that silver thing hanging under the dash? Anyhoo, what is it? You know it's a mid-70's V8 when the a/c compressor weighs as much as a Prius.